There is much debate lately about whether the EU and the IMF should give Greece more time to repay the €110 bn it has borrowed. While any extension should depend on Greece continuing to fulfill its obligations under the memorandum, the extension makes sense. In fact, without an extension from the EU and IMF, Greece would most likely default. To understand the case for the extension it is important to understand two points about Greece’s rescue package. First, this is not a rescue package: all the EU and IMF did is to lend money to Greece at a lower rate than what markets were asking. 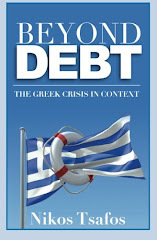 By Q2 2013, the program will come to an end, and Greece will need to continue to pay down its existing debt (including its debt to the EU and IMF) as well as to raise funds from the market to cover any future financing needs. The second point that one needs to know is that the re-payment program to the EU and the IMF is heavily front-loaded. Disbursements end by Q2 2013, and Greece will start repaying right after that. In fact, about two-thirds of the debt should be repaid by 2015 and about 90% of it by 2016 (the debt goes away by 2018). The graph below presents the numbers around this dynamic and shows clearly the speed with which the positive turns negative. With these two facts – Greece faces a re-financing need by 2014 and the repayment schedule towards the EU and IMF is heavily skewed to 2014-2015 – we can ask the following question: how much of the repayment challenge that Greece faces by 2014 is due to the EU and IMF debt and how much comes from other debt? The graph below is my estimate of that figure – it is somewhat imprecise given the opacity of the data, but the error margin is not very high. What this tells us is that Greece’s repayment challenge in 2014 is fundamentally a challenge in paying back the EU and the IMF. More than half the debt service in 2014 is EU/IMF debt and more than 60% is in 2015. 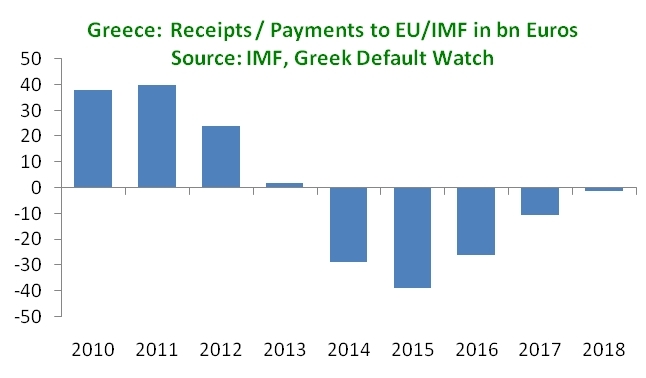 In other words, if the EU and IMF do not extend the time for Greece to pay back its debt, Greece’s position in 2014 becomes exponentially harder. 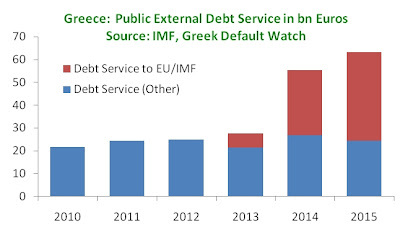 In fact, if no extension comes, Greece is almost sure to default and might as well give up on the program now.